So the promotion is finished, the stats are in. Let’s see how I did. As discussed last week, I ran the promotion for three days over the bank holiday weekend: friday to sunday. I submitted details of my free book promotion to 16 sites – almost all of which said in their blurb that they ‘may’ feature your book – or, of course, you could buy guaranteed promotion for a small fee of generally $5-15. I elected not to buy any guaranteed promotion, but to see what I could actually get for free. Of those 16 sites, as far as I’m aware only FreeBooksy did feature Darklands, and I’m pretty sure I have them to thank for a large percentage of my total downloads. Friday started fairly slow, but suddenly began to gather pace around 3 o’clock – presumably when FreeBooksy’s email alert came out (I had subscribed to many of the sites I submitted to, but somehow neglected that one. However, I did get an email from them at 4.30 advising me that my book was featured on the site). For the next several hours my download stats jumped by about 100 every hour. In any case, there wasn’t much to see after that. At six pm friday my downloads stood at around 300. At 9pm, 600. By 9am the next morning I was very close to 1000. But it all tailed off from there. My tally for the three days is 1135. I estimate that my own efforts via Twitter, Facebook and generally being chatty and personable to anyone I met online over the weekend resulted in between 100-200 downloads. My conclusion? If I run free days again I will pay for some promotion. I think I was lucky to get the freeBooksy promotion, and without it this would have been a bit of a wash out. It’s a lot of trouble to go to for possibly only 100 downloads. The promotional ads for these sites are not expensive, typically between $5-15. Extrapolating from my miniscule sample size of one, my best guess is that you could expect perhaps 1000 downloads per promotional site feature. I wonder how many of those downloads will ever get read? I know from my own behaviour that I will often grab a free book while I can, without even reading any reviews or the sample. I will skim the description, and if it sounds even vaguely intriguing, I’ll have it. Then it sits on my kindle untouched until I happen to find myself with some time to kill and no current book. I generally read through a few samples/free books, scrapping them for not being good enough/not being my thing – until either I find one to settle with and read, or just weary of the whole proceses and go do something else. So I know there’s a good chance that many of those downloads will never be looked at again. But I have no idea how many. From those that do get read I should hopefully get some new reviews. They may not all be good reviews, of course, but that’s all part of the process. I guess it will take weeks or even months to see what I reap from this promotion. All I can tell you right now is that four more people have added Darklands to their lists on Goodreads. I’d be interested to hear what experiences others have had with their KDP Select free days. Similar to mine, or vastly different? Did you pay for adverts or just try to go it alone? And did you ultimately reap the increased reviews/eventual sales you were hoping for? The free promotion of Darklands is going pretty well. I’ll have a full report on it later this week, but I’ve had over 1000 downloads from all over the world, and that makes me happy. I’ve also found quite a few free books to snap up myself while perusing all the free book promotion sites. One in particular caught my eye because the cover is almost identical to a photo in my collection – in fact I used it on a post about writing blurbs last year! The angle is slightly different, but I’m pretty sure that’s the same tree. 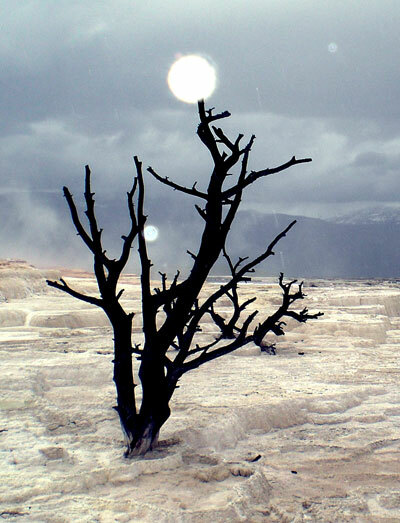 I snapped it on a visit to Yellowstone National Park two years ago, at one of the hot springs. Mammoth, I think. I know its a scenic spot, but what are the odds? Considering I live in Britain, and have visited the US twice in 40 years! 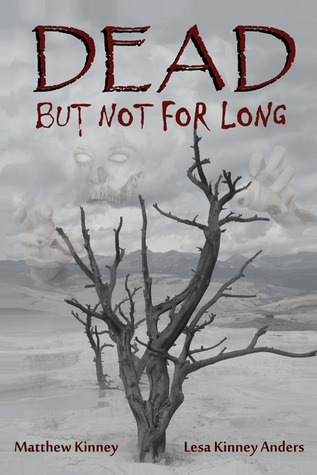 The book is Dead, but not for long, by Matthew Kinney and Lesa Kinney Anders, and it’s about zombies – hurrah! I’ve been umming and ahhing for some time over whether or not to offer Darklands free for a few days. I see compelling arguments on either side. Pro: Increased exposure. Persuade doubtful readers to take a chance. Find new readers shortly before Kikimora‘s release. Con: I spent three years writing that book. Surely it’s worth more than £0.00? Doesn’t offering free books devalue the whole writing process? Will people take me seriously if I give my hard work away? I’ve finally decided to give it a go (thanks in part to this excellently reasoned post by Lisa M Lilly), and Darklands will be free on Amazon this weekeend, friday to sunday (though, I believe it works on US Pacific time, so I guess it won’t be free until something o clock friday morning). Once I had set the free dates, I found as many sites as I could that would promote free books. There are a lot of them out there. Here’s a helpful list to get you started. But what I found was that although most of these sites may promote your free book for free, they also offer guaranteed promotion for a small fee of typically $5-15. Doesn’t sound like much, does it? Part of me is thinking I probably ought to buy at least one promotion package, to ensure that this whole endeavour isn’t a big waste of time. But I’m holding out in the name of scientific curiosity; to see how effective any of these paid promotions are I first need a control result. I’ll be interested to see whether any genuinely free promotion actually happens. If it doesn’t, never mind. I’ll try again when my next free days roll around. I’ve submitted details of my free promotion to around 20 sites. I didn’t get around to doing this until sunday/monday, and most of them request at least a week’s notice on your promotion, so that might hamper my effectiveness somewhat. There was more I could have done, but I had already spent three hours filling in forms with the same details over and over again – apart from the ones that wanted some unique information (in fact, that was probably what took up most of the time), and I was heartily sick and tired of it by then. What I also found during this process was the amount of other promotional tools out there – there’s a load of stuff on Goodreads that I wasn’t even aware of, although I use it fairly regularly as a reader. So I have also offered free promotional copies to reviewers on a discussion thread for that purpose. I have discovered that there’s a lot more promotion I could be doing all the time, not just when my book is on offer! The dificulty, of course, is finding the time. For instance, this week I am off work and working hell for leather through a massive redraft of Kikimora. I want to work through all the structural changes in one fell swoop, so that I can keep mentally on top of all the story threads. I’m going to struggle to fit all the necessary work into one week (even with the bank holiday weekend), and resent even an hour of my time taken up with other tasks (like writing blog posts)! So this free promotion is an experiment. It might be a complete fail. But I’m interested to find out, and I’ll let you know how it goes. What I really want to achieve from it is increased exposure in the US – a market I have so far failed to dent in the slightest – and more reviews, on Amazon US, Amazon UK, Goodreads, or anywhere else. Who else has used KDP Select free days? Did you find it useful? Gain many new fans? Did you pay for any promotion of the free days, and how many downloads did you get? A proud moment today. 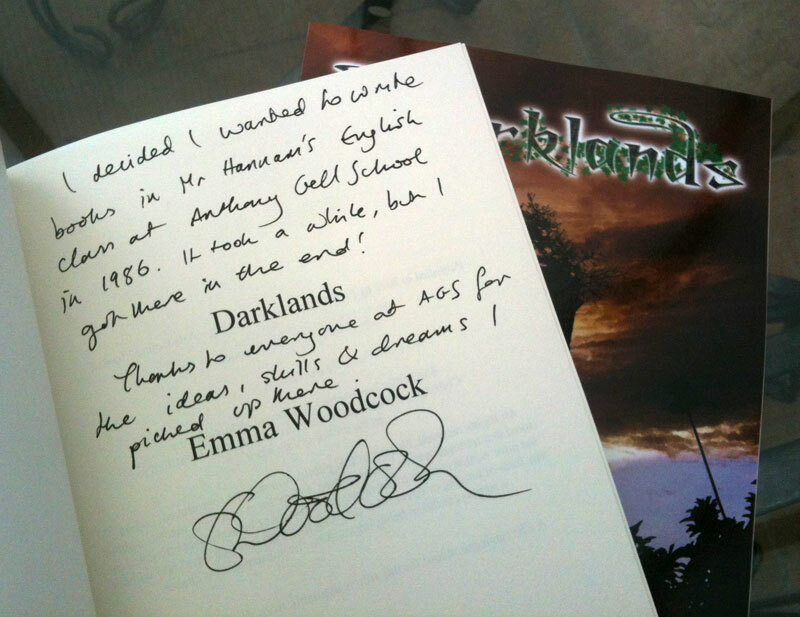 My old school requested a signed copy of Darklands for the school library. When I was young I wanted to be lots of things: a pirate, James Bond, a mad scientist with sticky up white hair, Tarzan, a painter, an explorer… I also kind of liked writing stories. But I remember quite distinctly at the age of 13 realising that writing was the one; the real one. That’s what I was going to do with my life. And I have, more or less. It doesn’t yet pay the bills, so something else has to, but I have been writing stories on and off for over quarter of a century. It takes me a while, and if something isn’t quite working I set it aside for a year or two. Or ten. But I got there in the end, publishing my first novel, Darklands, in 2011. When my old school requested a signed copy it made me think of the time in Mr Hannam’s English class when the idea took hold in my mind that I would be a writer. I don’t recall specifically what sparked it; but I knew that I loved words; I loved stories. And whatever magic made printed words sweep you up and take you on incredible journeys – I wanted to do that. As an indie author it’s easy to get demoralised and to feel that you’re shouting into a void, but today I’ll take a moment to feel proud. I made a decision at the age of 13; I worked towards it in my spare time, I persevered when I felt discouraged, I made sacrifices of time and earnings – and 25 years later I achieved what I’d set out to. I published my first novel.